Terra sigillata pottery has been around since the ancient Greeks created their famous black and red pots, but it is certainly not “getting old.” Contemporary potters, such as Sharon Alpren, are making exciting and beautiful terra sigillata ceramics to this day. In today’s post, an excerpt from the November 2016 issue of Ceramics Monthly, Alpren shares the terra sigillata technique she uses to make her gorgeous textile-inspired bowls. – Jennifer Poellot Harnetty, editor. P.S. Learn how Sharon Alpren switched from a career in retail buying and textiles to one as a studio potter in Melbourne Australia. Read about Alpren’s experiences and see more of her work in in the November 2016 issue of Ceramics Monthly. 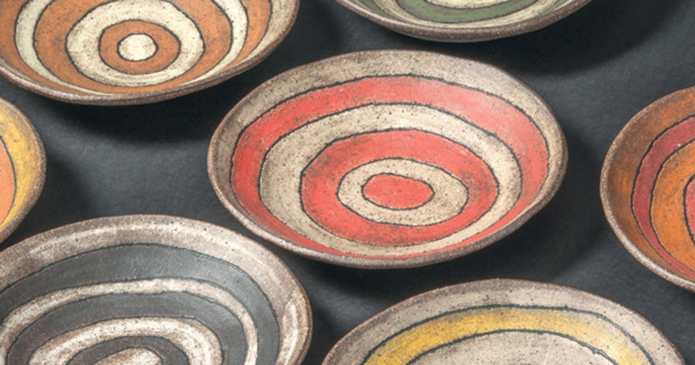 I throw my Bedrock series bowls on the wheel using a richly colored and highly textured stoneware clay (A). After leaving the bowl to firm up for a couple of hours, so it is no longer wet and sticky but still very pliable, I then alter the bowl to give it a more organic shape by squeezing and stretching the clay between my hand and a wooden kidney tool (B). When the bowl is completely dry, I use a sgraffito tool to incise the lines that will later be filled with black inlay slip (C), then apply an undercoat of white terra sigillata, rubbing it into the textured clay with a soft rag (D). The clay is very dark when fired and the colors require a white undercoat to show up. The colored terra sigillata is brushed on next (E). Terra sigillata can be rather thin so it may take up to three layers or more to build up sufficient color. I burnish the terra sigillata with a soft rag so that the texture of the clay comes through. After bisque firing, I inlay a black engobe into the incised lines and sponge off the excess (F). Then, when the piece is bone dry, it is fired in a gas kiln to cone 9, in medium reduction. bisque firing, bone dry, clay, reduction, sgraffito, slip, stoneware, terra sigillata. I thought that the “buttery” glow of the terra sigillata would burn out if fired past o4? That looks very interesting. Might have a go at that. Looks great. Sharon, can I ask what you use to colour the terra sigilata? I’ve just returned to ceramics after a long break and have been exploring terra sig. I’ve made a batch and am happy with the satiny surface it produces but don’t know what to use to colour it. I live in regional Vic so would probably buy supplies from the same places as you.